The United States boasts a rich musical diversity. Colonial Americans integrated European traditions with new cultural influences to compose a unique musical identity. African traditions influenced hymns and folk songs that connected people to religion and to the trials and tribulations of everyday life. Patriotic tunes created unity in wartime. America’s jazz, blues, rock, and hip-hop continue to evolve from their African-American origins. 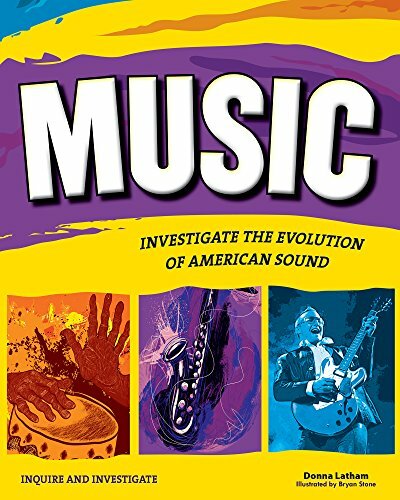 Music: Investigate the Evolution of American Sound invites kids ages 12 and up to explore the roots of American music genres as they investigate the social, political, and religious influences that inspire musicians. Activities encourage readers to inquire into the art and science of music. Readers can engage in a hands-on exploration of the physics of sound vibrations, decibel levels, and acoustics, or use vocal styling to improvise and discover the rhythm of their bodies to create a beatbox. Music encourages readers to analyze lyrics, their meanings, and rhythms, and then use that analysis to write their own songs. This title meets common core state standards in language arts for reading informational text and literary nonfiction and is aligned with Next Generation Science Standards. Guided Reading Levels and Lexile measurements indicate grade level and text complexity. If you have any questions about this product by Nomad Press VT, contact us by completing and submitting the form below. If you are looking for a specif part number, please include it with your message.